This stunning home begins with a storybook entrance through a vine-covered arbor and tiled walkway. While only 4 years old, the home has already undergone a significant update with designer style at every turn, including a stunning remodeled kitchen, new cabinetry in many rooms, and the pièce de résistance –Built in closet wardrobes plus a boutique closet room. 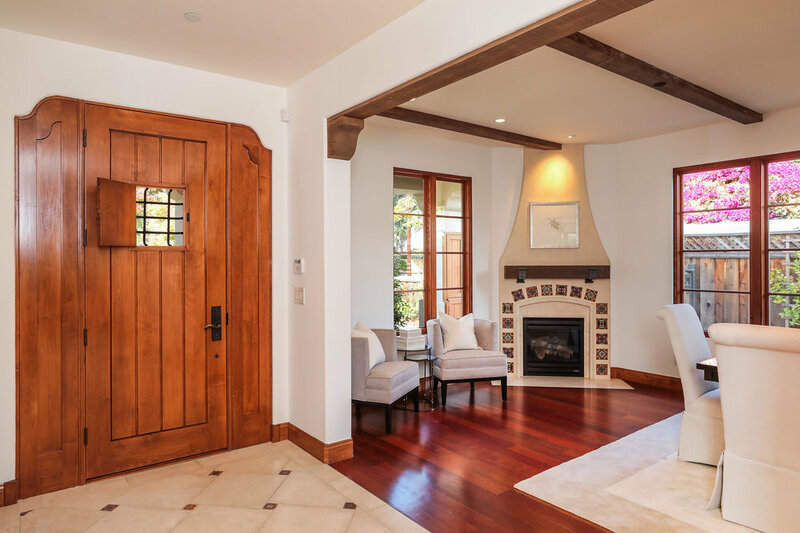 Gorgeous Brazilian cherry wood floors unify all three levels, exposed beams cross the ceilings, and custom stained-glass windows span the staircase – all exemplifying the home’s Mediterranean ambiance. There are 6 bedrooms, each with en suite bath and arranged over all three levels for the utmost in privacy, including a lower-level bedroom currently customized for an executive office. This level also boasts a spacious recreation room that doubles as a media center, a customized wine cellar for your finest selections, plus a fitness center with fully mirrored wall and ballet barre. Whether accommodating guests, extended family, an au pair, or large family, this home is perfect every lifestyle need. Outside, the grounds have been transformed into a lush private setting with beautiful gardens, ivy-covered walls, and two covered patios including a spacious loggia adjoining the detached 1-car garage. An electronic gate enhances the privacy and the long paver stone driveway provides added space for outdoor entertaining or off-street parking. Adding the finishing touch to this remarkable home is its amazing location less than one mile to University Avenue shopping and dining, just blocks to Eleanor Pardee Park or Rinconada Park, plus access to acclaimed Palo Alto schools. Information Request for 812 Lincoln Ave.